There are lots of great freebies coming up; so we wanted to put them all in one post for quick reference, so you don’t miss any freebies. We will also have the upcoming freebies on the right hand side of the page under “Upcoming Freebies”. 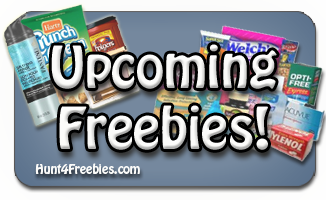 Each time we add a new freebie we will add it to this post. We will post reminders for all of these freebies and you can also follow Hunt4Freebies on Facebook , Twitter , Google + and Hunt4Freebie Coupon Facebook Page for all the latest freebie updates. For those of you who are new to Hunt4Freebies listed below are quick links to current freebies that are available! Get ready for a mailbox full of freebies!! 🙂 Were so glad you found us! Moms Meet = FREE Samples, Gift Cards and More! FREE Purell Hand Sanitizer at Target + Purell Gifts And More! FREE Crown Royal Gift Labels and More! FREE Holiday Kindness Rocks Event at Michaels on November 12!